If you were to combine all of my favorite things into a single object, you might end up with something that looked very similar to this Once Upon a Crown by Remarkable Oblivion. This new-to-me store by AxsisThorn is affordable and unique! I thought the items looked too good to be SL (a few vendor images are renders), but once I teleported to the store in-world, I saw the things on display and they looked amazing. This crown is copy/mod and includes a resize script. I shrunk it a lil’ bit for my head, and I’m never taking it off. Today I am at the Izzies sim, playing in the gorgeous field of flowers. 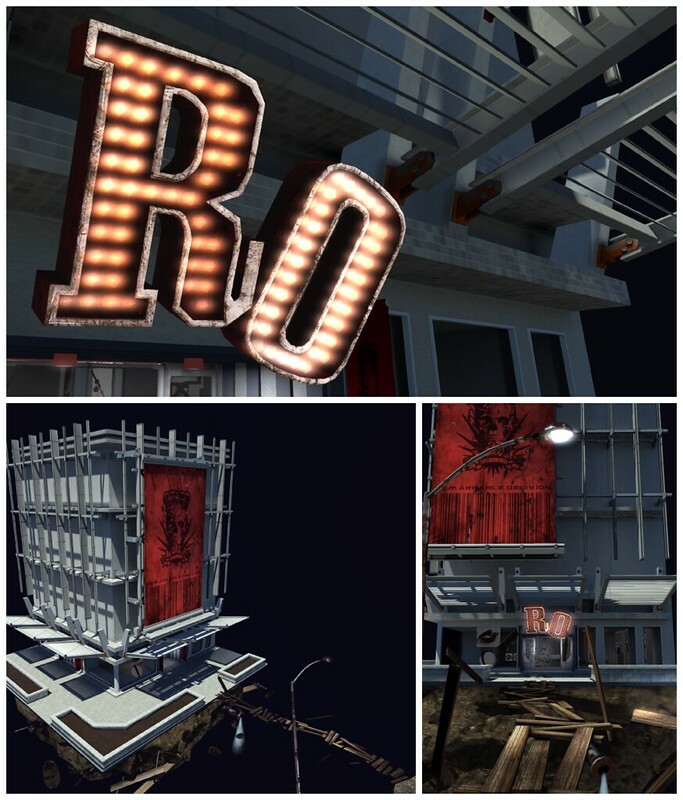 Check out the Remarkable Oblivion store in SL! Once you teleport to the store, just walk across the bridge and you’re there. This creator may be new to SL, but he has created 3D and mesh professionally since 2005. I hope to see even more cute accessories in the future! First I would love to ..”Check out the Remarkable Oblivion store in SL” however your link to the shop doesnt work, a simple search found it easy enough though. Second, “Be sure to join the RO – Remarkable Oblivion group in-world for a group gift!! It’s something wearable :)” Not as easily done! You need to go back to the search to find the group, join it and even then there is no actual GG visibly marked at all, anywhere on that sim to that shop! Area search…group, gift, member nadda. 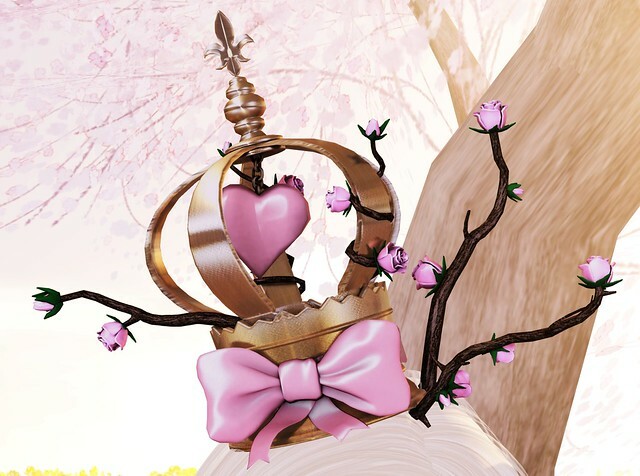 Wicked pretty crown, but not so helpful post! Such a beautiful crown, easy to resize and sits so nicely on your head, gorgeous detail! Thanks so much. I see there’s finally been an update to juicy pumps at some point already. Pity you never annunced it, because I was almost too late to care – already started buying some of N-Core’s pumps for them not having invisi prims. Didn’t fatpack those only because their coloring isn’t as fortunate as Juicy’s. But yay, finally. It’s been such a long wait, 2 years I think? I’m not sure what if your relation to these shoes, 1 avatar made them, another sells them? I may have weirdtastes for liking them, and perhaps the one and only to wear them now on, but to me they are the most precious shoes in the entire of my SL. Sandal-style feet+shoes are good for bare legs, but myself I wear hosiery more often than not, so some good footless pumps like these are irreplacable. And I did check almost all of other pumps in SL, and of all of them, they got really weird shape, like a banana or an empty balloon. Only Juicy and N-Core pumps got that pump shape that you could show close-up from the side and not be embarassed about. I really think you undervalue them alot for never wearing them again, Gogo. Maybe it’s just me, but at the time that I discovered Second Life and soon your blog, you were making a lot of pictures with pin-up pose props, and always in Juicy’s. And it looked so good on you, to me they became not only the ultimate pumps of all, but the shoes I will always think about when I think of you and your blog. Maybe it’s just me, but to me they did become something like the ultimate Gogo shoes. You avatar was shinig when she was wearing them. I think those pumps aren’t just precious, they are almost one of a kind unique goodness. Thank you for finally giving them an update, I don’t think I’ll wear anything but them in a longest time now. Omg, you’re so sweet. If you need an update, IM Juicy Littlething or Elven Dreamscape in-world and we’ll send it to you. Thank you for your offer, but I already grabbed a copy as soon as I discovered the update. Didn’t think such an offer would be possible in the circumstances. But that’s ok because I did spend more than 3 years wearing nothing but juicy’s (with rare exceptions of some prim feet) and probadly will keep things this way forever. For such a long term item I woldn’t mind paying twice to get. They are a timeless classic to me I guess. Both elegand and small+sweet, with a shape that actually manages to somewhat improve the ugly avatar feet. Wish they had even more options – such gold product like this deserves everything and more. Great to see it advertised!